Scott Sr. and Scott Jr. are from Sanford. We are a father and son crappie team. We enjoy the outdoors and love catching fish together. We both have been fishing since we could hold a pole. My name is Ronnie Bleas, I live in Ohatchee Al, with my wife Marilyn and 3 sons. I started fishing when I was around 5 years old. I used to get on my bike with a fishing pole and stay gone fishing all day. My passion has always been crappie fishing and I have enjoyed years of taking family and friends crappie fishing. I always dreamed of tournament fishing and last year I took that step, winning 4 crappie USA tournaments and 3 local club tournaments, along with top 5 finishes. I really enjoyed my first year of competitive fishing, but the best part is the friendships that I have made. We are a husband and wife team who, not only fish together, but we also run a business together. We enjoy the challenge presented when trying to catch crappie, either on a fun weekend or during a tournament. We have long term goals to be achieved in this sport and from a tournament perspective. Al grew up in Sanford Florida a block away from lake Monroe. He spent a lot of his childhood at his grandparents camp on the St. John’s river where he started fishing at a very young age. 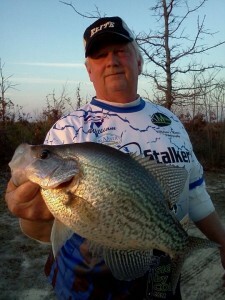 Him and his family have always enjoyed camping in Welaka, Florida and all the great crappie fishing in the area. They liked it so much they bought a home there in 2013. Al enjoys all types of fishing, spear fishing, and lobstering but spends most of his time on the lakes of north central Florida crappie fishing with his son Alan. Alan is 17 years old and our youth fishermen. He has been fishing ever sense he could hold a pole. 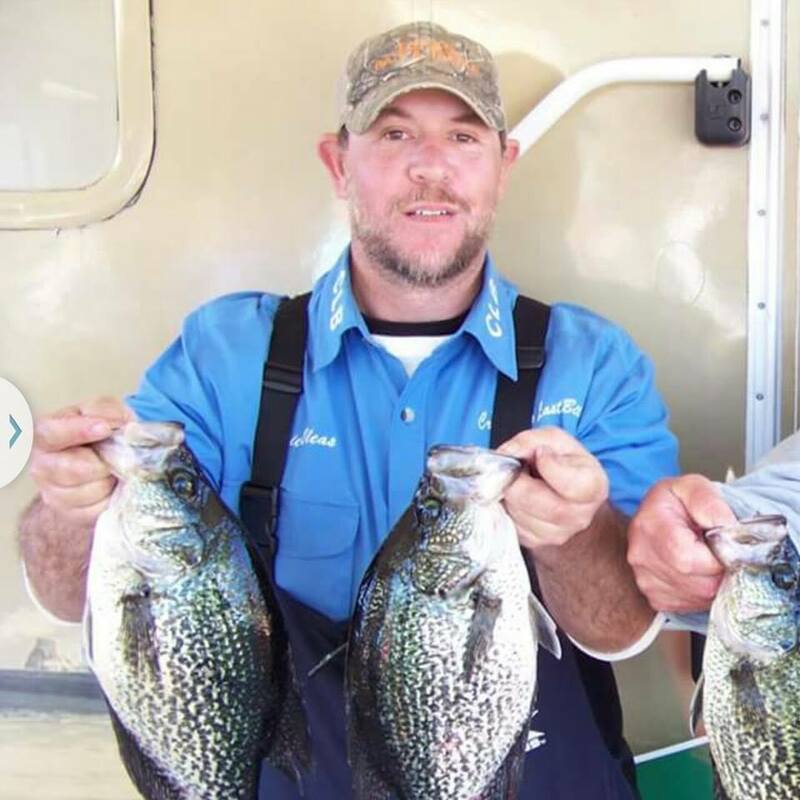 He grew up in Florida and enjoys all types of fishing but has a passion for crappie fishing. 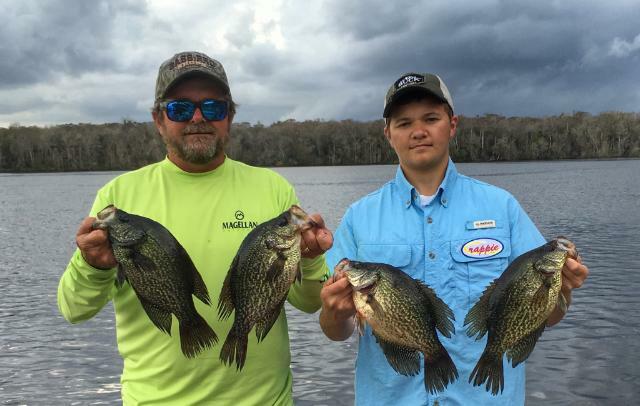 He is a member of Florida Crappie Club and has placed in the majority of the Northern Division Tournaments and has been fishing in tournaments since he was 15 years old! Al and Alan continuously placing in the Florida Crappie Club in the top 10! On April 1, 1989 I fished my very first crappie tournament on the famed Santee Cooper lakes in South Carolina. I finished in 11th place, but more importantly, I was hooked on tournament crappie fishing! 26-plus years later my passion for crappie fishing is burning hotter than ever, and while I still compete in numerous South Carolina local events each year my career has transitioned to also fishing regional and now national tournament trails. This transition began in 2011 when I won the regional Southern Crappie Tournament Trail event on Lake Oconee, Georgia, and accelerated in 2012 when I finished 4th in a Crappie USA national event on Lake Wateree, South Carolina. 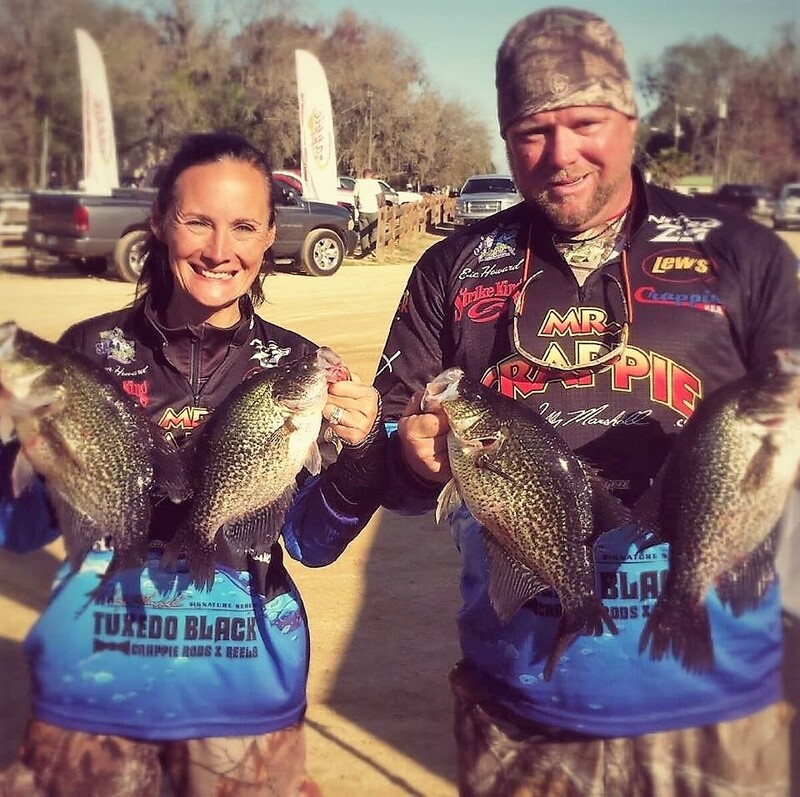 My string of national success continued in 2013 when I finished 2nd in a national Crappie USA event on Crescent Lake Florida, but when I placed 7th in the 2014 Crappie USA Classic I was certain that I could compete on the highest levels. A 3rd place finish in a national event in 2015 confirmed that I was on the right track, and so I will continue to prioritize competing in national events. Overall, with more than 500 top-ten tournament finishes over the last 26 years, I have had success at all levels of crappie fishing, and look forward to continuing to fish state, regional and national tournaments in the years ahead. While I have a passion for competing in tournaments and testing my skills against the best crappie fishermen in the world, I also have a passion for promoting the sport of crappie fishing and helping people learn to catch more crappie. When I am not on the water I can be found sharing information on crappie fishing with other fishermen through social media networks, giving interviews for articles, and more. For approaching ten years I have provided insightful fishing reports to SCFishingReport.com and the South Carolina Department of Natural Resources, and fishermen constantly thank me for the updates and information I give. Some people wonder how I can afford to share so many techniques and secrets, but when you have a passion like mine for crappie fishing you want to share and help others find that same passion – while of course keeping a few tricks up your sleeve! George has been fishing since he was 6 years old. He loves all different types of fishing but his passion by far is crappy fishing. George has travelled all over the United States fishing and he has tournament fished in 11 different states. George has won every type of tournament that is offered except for a National Championship, which hopefully is coming in the not to distant future. Tim has been fishing 40 years and tournament fishing since 2007. He’s fished in approximately 30 national events and has been part of winning team in five of those events. Fished in seven national championships. He fishes in 12 different states, Canada and the Bahamas. 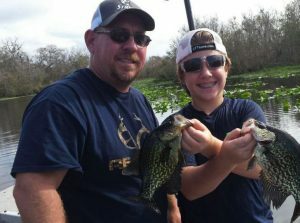 Tim has been part of winning team in Florida crappie club events approximately twenty times. Winning the Florida crappie club classic four out of the last five years. Danny and Beth Williamson have both loved fishing since they were children. Danny competed in Bass tournaments before they began fishing together. During their 22 years of marriage they have enjoyed Flats fishing, but, their love has been fishing the Crappie tournaments which have carried them to 10 states. They have won 4 National tournaments, been in the top ten in numerous National tournaments, been top Male/female in 4 tournaments as well as winning Big Fish. They will both tell you that the top prize for all of this has been the many enduring friendships gathered along the way. Darryl and Terri have been fishing tournaments for 20 years. They have been fishing in 13 different states and has won 107 tournaments. Darryl is a Crappie Guide for over 30 years. He is also the President of the Florida Crappie Club.